First time visitors should note not to ask for a Coke in the Inner Banks town of New Bern. The community has a proud history as the Birthplace of Pepsi Cola, and this claim to fame is celebrated at a number of locales around downtown, including the newly built Pepsi Family Center at the North Carolina History Center, (an interactive museum that takes patrons back in time to the year 1835), the innumerable antique stores which showcase pristine old Pepsi bottles, and the signature Pepsi Store.Any of these attractions are worth a look, and visitors should not be surprised that Pepsi is the star of local memorabilia, local menus, and drug store soda shops all around the town. 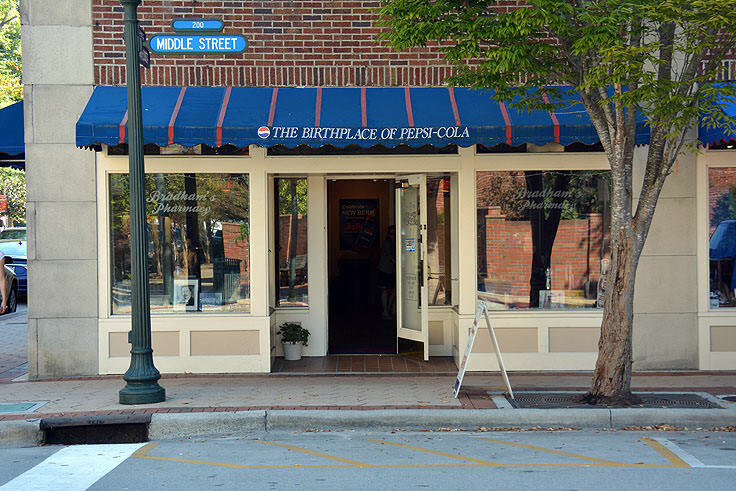 Pepsi was first known as the not-as-eloquent "Brad's Drink," a local carbonated beverage concocted and sold by 1893 by Caleb Bradham in his downtown New Bern Drug Store, located on the corner of Middle Street and Pollock Street. He renamed the drink five years later to "Pepsi-Cola," a nod to the pepsin and kola nut ingredients that supposedly helped digestion.The Pepsi-Cola company was officially incorporated in North Carolina in 1902, and by the following year, Bradham had registered the trademark and began selling the product both out of his drug store, and out of a rented warehouse space nearby in town, which served as a bottling facility. By 1905, Pepsi-Cola was being sold out of glass 6oz bottles, and within a few years, Pepsi-Cola was franchised in over 24 states. Despite growing the business to record levels, Bradham himself, however, enjoyed limited success in the long run. In 1923, Bradham and his Pepsi-Cola Company declared bankruptcy due to a drastic drop in sugar prices, (which unfortunately occurred right after Bradham had purchased a staggering amount of sugar at a significantly higher price), and the company was sold to Craven Holding Company for $35,000, while Bradham returned to operating his New Bern drug store. Pepsi itself, obviously, prospered to international levels, and is still the second-most popular cola brand in the world, and the undisputed most popular cola in New Bern, NC. 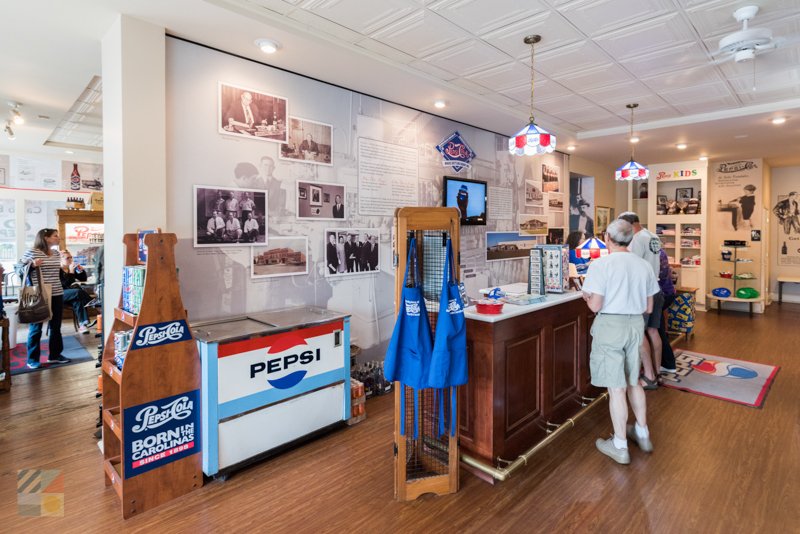 Today, Pepsi lovers can pay homage to the cola's roots at "The Pepsi Store," a favorite New Bern attraction that is located at the exact "Birthplace of Pepsi" in Bradham's original downtown drug store. 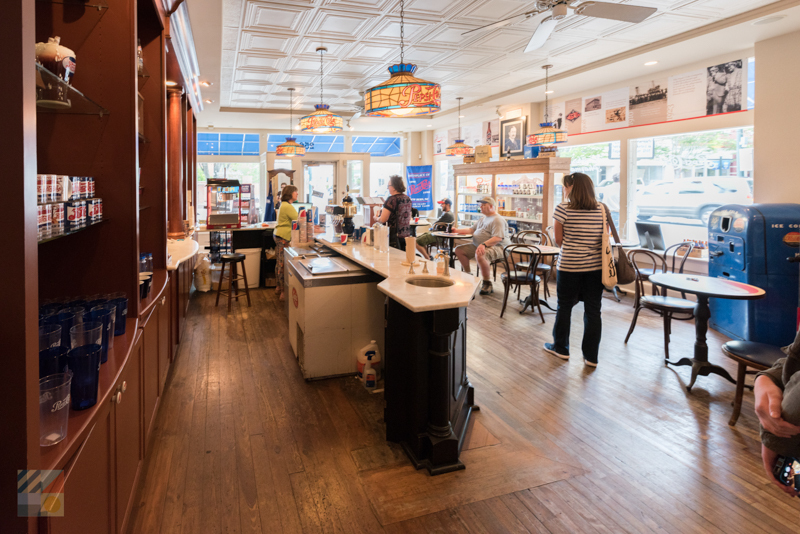 The Pepsi Store is part museum, part souvenir store, and part soda shop, and the small space features a huge variety of all things Pepsi. 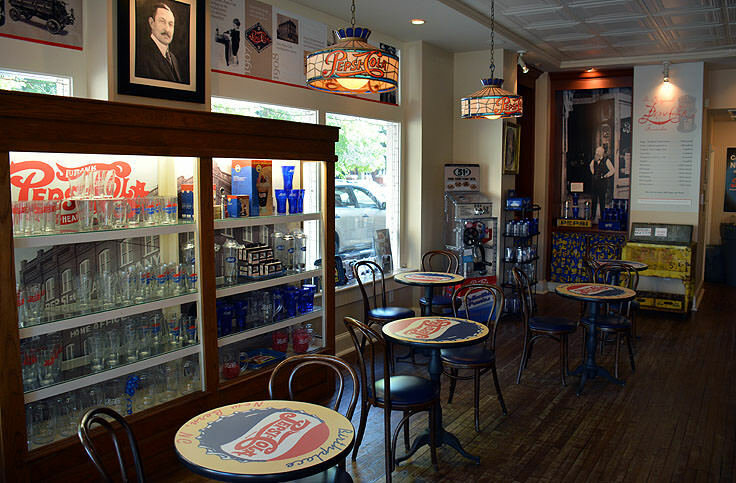 Patrons can pull up to the soda fountain "bar" and enjoy a freshly poured Pepsi Cola, or any number of created-on-the-spot fountain drinks, and enjoy the wide collection of Pepsi memorabilia that adorns every corner of the shop, from the antique "$.05 cent Pepsi" wall hanging to the glass Pepsi lights that hang over the bar itself. As for shopping, Pepsi fans will find just about every type of Pepsi merchandise under the sun at the store, from historic crate Pepsi truck models to authentic Mountain Dew T-Shirts. 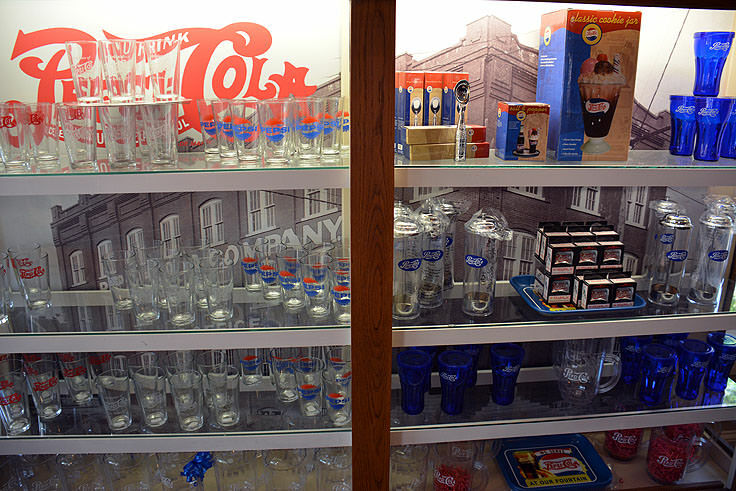 An all-encompassing collection of Pepsi wares that includes apparel, collectables, ornaments, ball caps and more, the Pepsi Store is a favorite New Bern souvenir shop for many Inner Banks vacationers. The Pepsi Store is open year round, Monday through Saturday from 10:00 a.m. until 6:00 p.m., and Sundays from noon until 4:00 p.m. 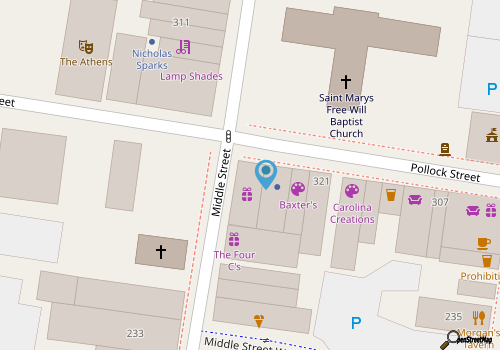 Surrounding the store, visitors will also find blocks of antique shops that specialize in antique Pepsi bottles and merchandise, some of which from the original downtown warehouse where the cola was first produced in mass. While the honor of being the Birthplace of Pepsi Cola may very well just be another feather in the cap of this already treasured and historic town, New Bern residents and long-time visitors alike are proud of this little component of its legacy, and the "Pepsi" brand can be spotted in just about every shop, convenience store and local downtown menu. While visitors certainly won't be thrown out of town for requesting that other internationally-known cola brand, it's pretty clear that in New Bern, Pepsi is king.